I really need a beach vacation, not just for some real R&R, but also to rock a rad swimsuit! I enjoy a properly cut two piece from time to time. However the fruits of age don't always serve me well. So in place of a twosie why not rock a onesie? like the hot style from the 50s. It honestly flatters every body shape, and they are oh so cute. 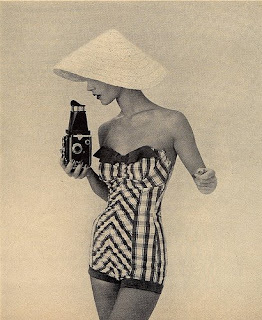 I found this cool link if any of you are interested, vintage bathing suits from any era... and the prices are nice too!